Hello Speechie Freebie readers! 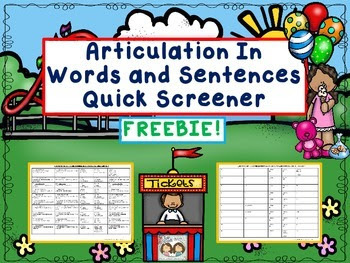 This month's Twin Speech, Language & Literacy LLC freebie document is a terrific articulation screener to be used for data collection at the start of the school year, or anytime in which you would like to do a quick screening for a student during the year. What you will get with the download is our two page quick print articulation screener. It screens 52 sounds at the word and sentence levels! Yes, sentence level too! :) Enjoy the freebie and click HERE or on the picture below to go grab it in its entirety today from Teachers pay Teachers. Wishing you all quick, useful and productive articulation screening times with your students this up-incoming therapy year!